Dion racing snowshoes with quick-fit binding - fast and light for snowshoe running on hard-pack snow. Last year I learned the surprising answer to that question: “Because running is fun and skiing every single day may not be ideal for your body.” Here are some ideas for getting you started with snowshoe running in Tahoe and beyond. First and foremost, you need snowshoes designed for running. The massive boats that we use for trudging deep Tahoe snow around the house are difficult to walk in, let alone run. This snowshoe review article in Runner’s World, though a bit dated, will give you an idea of what’s available. I use Dion Snowshoes (racing frames), which are fast and light. The flip side is that they offer so little flotation that they are only usable on fairly hard-packed snow. Once you’re geared up with snowshoes, take stock of your winter clothing. It’s easy for me – I simply wear my cross-country ski garb. With typical Tahoe weather, you’re more likely to overdress than underdress, so think in light layers. I wear my regular trail running shoes (currently New Balance 101s) and my feet are certainly wet by the end of the run. It is not a problem during the run – just be sure to pack dry socks and shoes if you have a commute home. In fact, most everything will get wet, if not by snow-melt, then by sweat. Put your cell phone (and anything else that needs to stay dry) in a plastic baggie. Tahoe’s numerous, world-class cross-country ski resorts offer excellent snowshoe running venues. The down-side is that you will need a trail pass. The up-side is that you will have access to well-packed snow, off-street parking, base lodges and trail maps. All of Tahoe’s resorts allow snowshoes, and most also have snowshoe-only “single track” groomed by snow mobiles. North Tahoe resorts include: Tahoe Donner Cross Country in Truckee, CA; Tahoe XC in Tahoe City, CA, Royal Gorge at Donner Summit; and Northstar-At-Tahoe near Truckee. 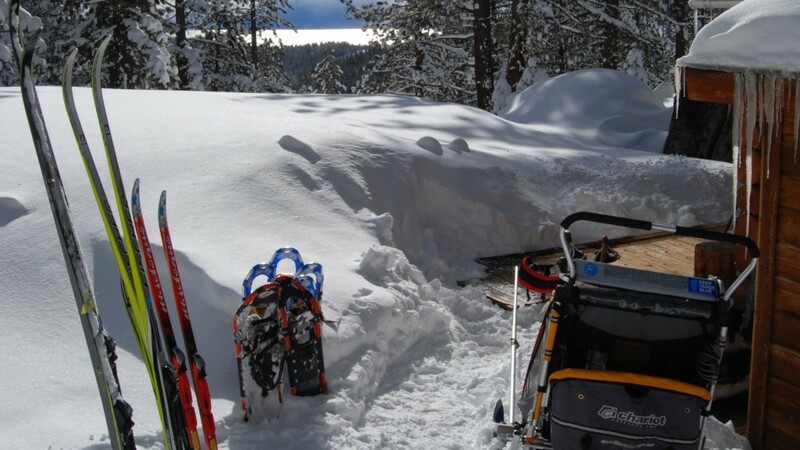 Spooner Lake Cross Country, on the Nevada side, is also very snowshoe friendly and offers overnight adventures in its well-appointed backcountry cabins. Of these, Northstar-At-Tahoe is the only one that offers a limited supply of rental snowshoes specifically for running. Four-legged friends are welcome only on certain trails and during certain hours at Tahoe XC and Royal Gorge. Check in advance for details. 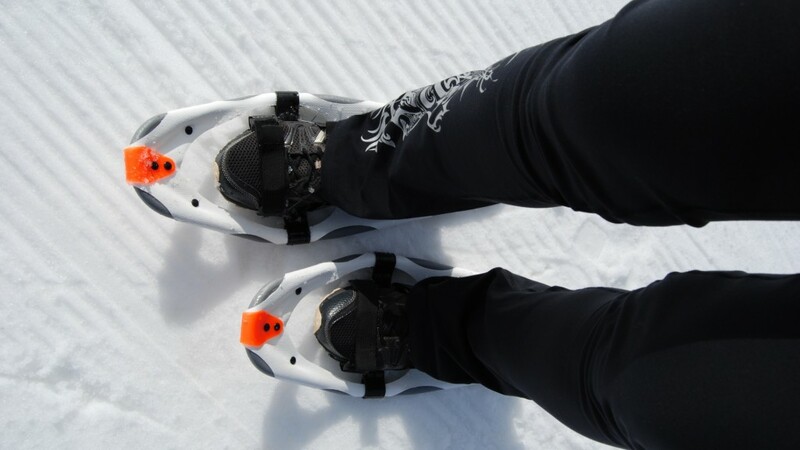 Snowshoes or skis get you to peeks of Lake Tahoe from the Wildcat Cabin at Spooner Lake Cross Country Center. When you do find yourself running on the groomed ski trail, follow these simple courtesies: Take care to never clobber the classic ski tracks (the ones that look like train tracks); Don’t run right down the middle of the skate lane (the wide groomed area); Instead, stick to just inside of the classic tracks, or to the far edge of the groomed trail. If you are feeling more adventurous, you can try some local spots that are typically well-packed by snow mobiles and other users. Carpenter Valley Rd. at Alder Creek Rd. in Truckee is a favorite spot for dog owners. The Fiberboard Freeway (a.k.a. Forest Rd 06) between Tahoe City and Truckee is another well-travelled route. Stay tuned – I hope to do a full post on snowshoe running locations later this Winter. And, if you are not a skier, consider running The Great Ski Race, as described in this Sierra Sun article. Finally, I recommend that you don’t look at your pace on your GPS device when you go for a run with snowshoes. I get the sensation of running in slow motion and I don’t really need to see the frightfully slow pace on the watch to re-affirm this feeling. Focus on your best running form, relax and enjoy the beautiful scenery! Hi Helen, have you tried gaiters? With Goretex running shoes, and gaiters, my feet stay pretty dry as long as the snow is dr and packed., if it is wet and sinky, I still get wet, but with the goretex and good socks, I don’t feel wet. If it is warm enough to be wet snow, my feet don’t feel cold anyway. The gaiters keep the snow your snowshoes throw up from getting into the tops of your shoes at least. I was using a pair of stretchy DirtyGirl running gaiters, but the straps on the snowshoes wear holes in them, so heavier ones work better. I haven’t been out running in shoeshoes yet. I have been running on the roads with the dogs now that the trails are covered with snow and I don’t have time to drive with them to Glacier way or Carpenter Valley. another good place to snowshoe run is Prosser OHV. It had been groomed in the past for the snowmobiles, I even skate skiied on it a few times when I was able to get there early on a Thursday morning. I don’t know if they are going to groom this year. The fees that snowmobilers pay has been reappropriated. Even the snowmobile packed trails are good for running though, and the advantage over TDXC is being able to bring dogs, so I have mostly run there instead of TDXC in the past years. We have larger frames available for deeper snow. You can just swap your binding and cleat over when needed. Also, Biker Booties work for gaiters (check local bike shops). Don’t get the Neoprene type. Thanks for the note, Rosanna. Last I checked, Northstar XC has running snowshoes to rent, but they also may only have a couple of pairs – it’s worth a call. It has been extremely warm up here this week and might not even freeze overnight. You will definitely want to get out early to avoid running in complete slush. Let me know how it goes and HAVE FUN! Thanks, Helen. I’ll call NS, but was hoping to stick close to our homestay in TC. Well, if it all melts away, there’s always trail running! Tahoe XC is generally more scenic & has easy parking, but Northstar should have colder snow right now.